The term “muscle confusion” is thrown around by a lot of trainers and online fitness gurus. Chances are you’ve heard someone in a group fitness class or online about the benefits of confusing your muscles. If you’ve ever been confused about muscle confusion, you’re not alone. Despite its popularity, muscle confusion is actually a fitness myth. The main concept behind muscle confusion is the claim that you need to constantly switch up your workouts in order to prevent your muscles from getting “used to” the workout, and thus continue to get stronger. For example, let’s say you love doing pulldowns. Those who believe muscle confusion would tell you that you can only do pull downs twice a week, and need to do other leg exercises the other days, because if you squat during each workout your muscles will get used to the squatting movement and stop responding to it. What is True About Your Muscles? Here’s the key to actually getting stronger: you need to keep challenging your muscles when you work out. You do not necessarily need to switch up your routine to confuse your muscles, but you do definitely need to continuously increase the intensity of your workouts as you get stronger in order to keep challenging your muscles. So, back to our pulldowns: if you love to do pulldowns, you can do them often and still build muscle. The key is to make them harder over time. So, you need to progressively increase your reps and/or weight. If you do the same number of reps at the same weight over time, you will not see any muscle growth. But if you keep challenging your muscles, even if you are doing the same movement, you will continue to get stronger. This is thanks to microscopic tears. When you work out and challenge yourself, you actually cause tiny tears in the muscle. The body’s process of repairing these tears is how your muscles grow and get stronger. As long as you keep increasing the intensity of your workouts and causing these tears, you will see muscle growth. No confusion required. It can be difficult to determine just how hard you need to work your muscles to get an effective workout. The best rule of thumb to follow is to increase the intensity, even slightly, every time you work a muscle group. If the intensity of your workouts stays the same over time, so will your muscles. To optimally build muscle, you should try to work your muscles to failure. That’s what happens when you work out with QuickHIT Fitness Labs. Our high-intensity training method safely works muscles to failure each time, so you are guaranteed to get stronger each time you come into the gym. Our personalized, individual training sessions ensure that you get an intense 20-minute workout, a more efficient and effective workout than most people get at the gym. Your trainer will track your progress at QuickHIT Fitness Labs, so you’ll be able to see your progress happening each time you work out. 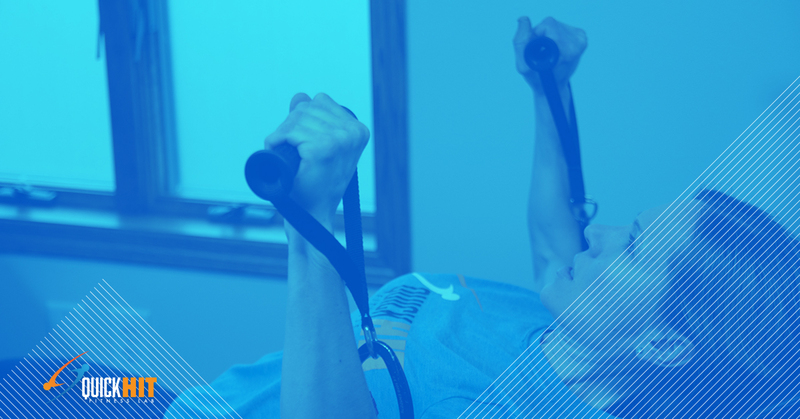 At QuickHIT Fitness Labs, you’ll increase your strength without having to worry about confusing your muscles- or yourself. Interested in trying our intense high-intensity exercises? Sign up for a free session today!